In Rome period, Christianity was seen to became diffused rapidly in second century in the region and began a very big struggle between Christians and priest worshiping idols. In Cappadocia, a lot of underground cities belonging to third and fourth centuries built by Christians to be protected and to worship, came to the surface for this reason. 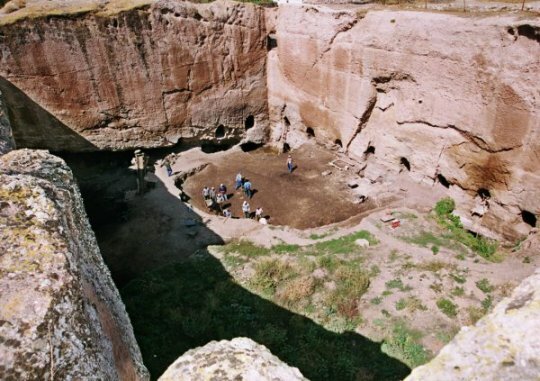 The most important ones of these underground cities existed in the borders of Kirsehir are Kepez Underground City, Mucur Underground City and Dulkadirli Underground City. Entrance of the underground city 50 km far away from Kirsehir, constructed by Christians in fourth and fifth centuries, later seen Byzantium, Seljuks and Ottoman effect starts with a tunnel, 22 m length and vault-shaped and opens to 30x50 m length court. In the east, west and north front of the court, 5 living rooms and 8 rooms are found, constructed as a rock carving style. All rooms open to the outside with 16 round arches. You can come down to the downstairs only by a ladder from the room number 5. Also, in this room there is a water well. In gallery part, there are two Stone masses, which are consider as a millstone, but it is thought that these stone masses were used in order to close round arch doors. Nevertheless, in the room at the end of the gallery, a small millstone is also found. In the same room, a small temple exists that is guessed it may be used by christians and covered with signs scrapped on the rocks. In the 130 m east of the underground city, two-courted settlement is found, too as a continuation. The underground city, which resembles to inn in Seljuks as a architectural construction and plan, differentiates from others with its plan features.